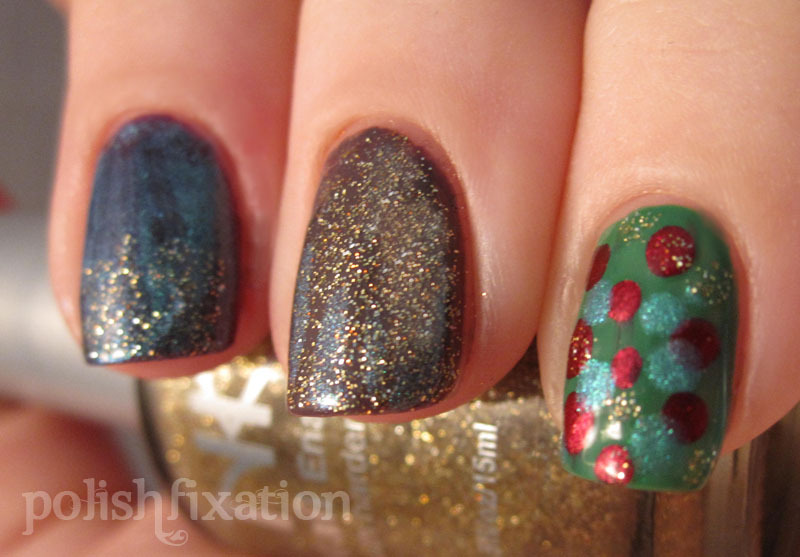 polish fixation: Fall Colors by NK! Not long ago I posted some awesome colors by Nicka K New York, and today I have some more for you to enjoy! These are new for the Fall/Winter and are gorgeous! They are all great on their own or as "underwear" for festive glitters and shimmers! Grape Purple is a deep purple creme polish. Just 2 coats for the picture above. This is such a rich shade! Muddy Purple is a neutral grayish purple creme. In the bottle I didn't think I'd like this one very much, but after painting on 2 coats I really liked the look on the nail. Red Orange is, as the name suggests, a reddish orange creme. I really like this color a lot! The pictures picked up some VNL with 2 coats but that was not visible at all in person. It's an all-around great color for any time of the year! Grin is definitely my favorite of the bunch! I don't really have any greens like this in my collection. Another 2-coater that's rich and creamy. Love! Turquoise is a sheer icy blue shimmer. I did 3 coats to get the pictured opacity. I love this shade, it reminds me of ice! Since the first coat is pretty sheer I imagine this would be great for layering over other colors for new shimmery looks. In the picture above, left to right: Grape Purple with a thin layer of Turquoise and Mardi Gras (another NK shade which I will swatch in a future post) sponged onto the tip. Muddy Purple with a layer of Mardi Gras and some subtle Turquoise "drips". Finally, Grin with dot of Turquoise, Mardi Gras, and Red Gems (swatched in previous NK post). I was really happy with these results and can't wait to try out more combinations! If you are looking to pick up any of these colors, the Fall 25% off Promotion is still going on for another week! I like the colors. Th grin is my favorite!